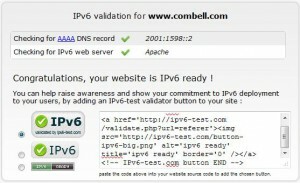 Tomorrow Combell will, along with other major companies like Microsoft, Google and Facebook, offer both IPv4 and IPv6 on its website. 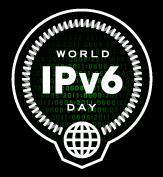 Most PCs and servers are already IPv6 compatible, but during the World IPv6 Day, its impact will be tested worldwide for one day. In the current IPv4, there are about 4 billion (4 × 109) Internet addresses of the following structure "255.0.0.0"; four decimal digit groups of 32 bits. In IPv6 there will be six hexadecimal digit groups of 128 bits, e.g. : "3ffe:6a88:85a3:08d3:1319:8a2e:0370:7344”. As a result, about 3.4 × 1038 are possible. This means 29 zeros more in number! The number of available IPv4 addresses becomes totally exhausted due to the ongoing growth in Internet access and its applications. The advances in electronics and the link it forms with the Internet and cloud environments is encouraging the growth of all possible devices in need of an IP address. During this boom a revision of both the scalability and security is certainly not a bad idea. The imminent exhaustion of the IPv4 addresses is even pressuring us to look for other options or to move to a larger network. IPv6 not only provides a larger address reserve with all its accessibility and scalability benefits, but it also supports plug and play which makes the boot-strap services such as DHCP (Dynamic Host Configuration Protocol) unnecessary, while bypassing the limitations of NAT (Network Address Translation) thanks to its superior network architecture. IPv6 makes it possible to provide security during data transmission. Data authentication ensures that data is not changed unnoticed or that no one can act as if they were the original sender. This way the receiver is certain about the origin of the received IP packets. Next to a better IP security, IPv6 also supports mobile nodes for mobile networks.